I'm going to be honest. I almost didn't share this post. When going through old outfits, I tried to look for items that I had featured in at least five or six looks, and I thought it might be fun to do an extremely versatile item -- a cardigan. I wear cardigans in probably 60-70% of my outfits, so I figured that it would give me a wide range of looks to share. 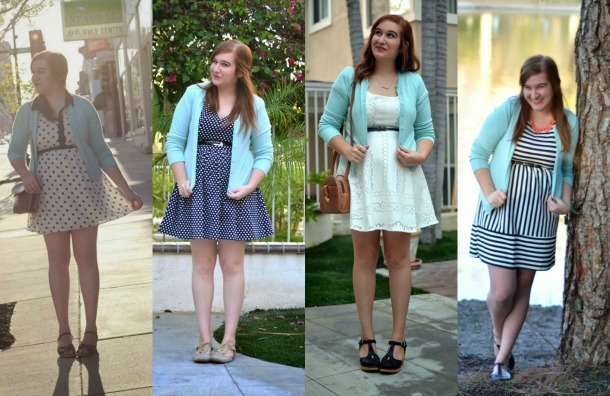 The first cardigan I thought of was this mint one that I thrifted a long time ago, and I was pleased to see how many outfits I had worn it in it. I started going through posts and saving photos into a folder, only to be a little embarrassed when I looked at them all next to each other. In the eight outfits I had found, I had managed to style it almost the exact same way in most: with something blue, something white, and/or something polka dotted. So much for versatility. I started looking through other posts to find another item to feature, but ultimately, I thought this was pretty funny -- and insightful. I think we all often struggle with defining our personal style, but embarrassing as it may be, it's a little comforting to see that I've kept it so consistent over the years without even really trying. That's okay in my book. 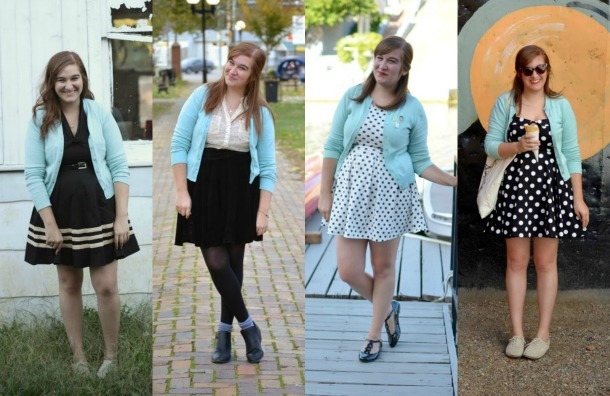 Which of my (very similar) outfits featuring this mint cardigan is your favorite? The black and white polka dress from "Ice Cream and Oranges"! So cute! I like all the looks. Not boring style, but a defined one.